Pirates of Teelonians (PoT) uses the same gameplay style that was made popular by Plants vs Zombies. The game takes the setting into pirate territory though and also adds a number of other features to create something new and exciting. The game was developed by Teelos games and released in 2012 after the successful release of the Teelonians Clan Wars game which also follows a very similar PvZ inspired setup. Your mission in the game is to stop the enemy pirates from taking your treasure by placing your pirate defenders into the correct lanes. Players can also upgrade their units and choose their captain to help them play the game based on the playstyle that they prefer. Pirates of Teelonians does away with energy generating units so you won’t need to worry about the optimal number of resource units or protecting them from attackers. Players instead slowly generate resources during the game with slain enemy pirates also dropping resources and power ups. Careful management definitely has emphasis in this game as resources can be carried along one level to the next. As previously mentioned players also have access to a pirate captain which acts like a super unit and is capable of moving between all lanes with ease to help boost the defences as needed. 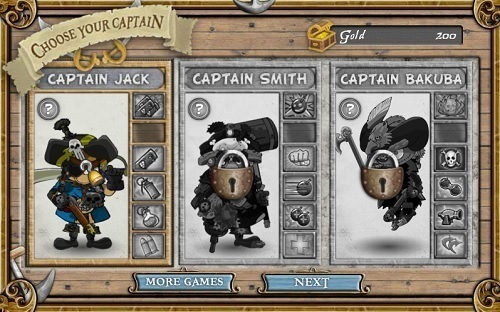 Each of these pirate captains has a unique ability and their own personality. You can further define your own personality within the game with a huge number of potential upgrades which allow you to favour the units that you prefer. PoT also splits up its standard gameplay with several mini games which help to break up the core gameplay but still feel like an important part of the game. Considering that Pirates of Teelonians is a free game that you can play within your browser the amount of content and hours you can get from the game is simply ridiculous. It will definitely entertain any Plants vs Zombies fan or general fans of the tower defence genre. Builds on gameplay made popular by Plants vs Zombies. Choose your own pirate captain to act as a super unit. Play for free in your browser. Upgrade units as you advance through the game. Mixes in several mini games to break up gameplay.